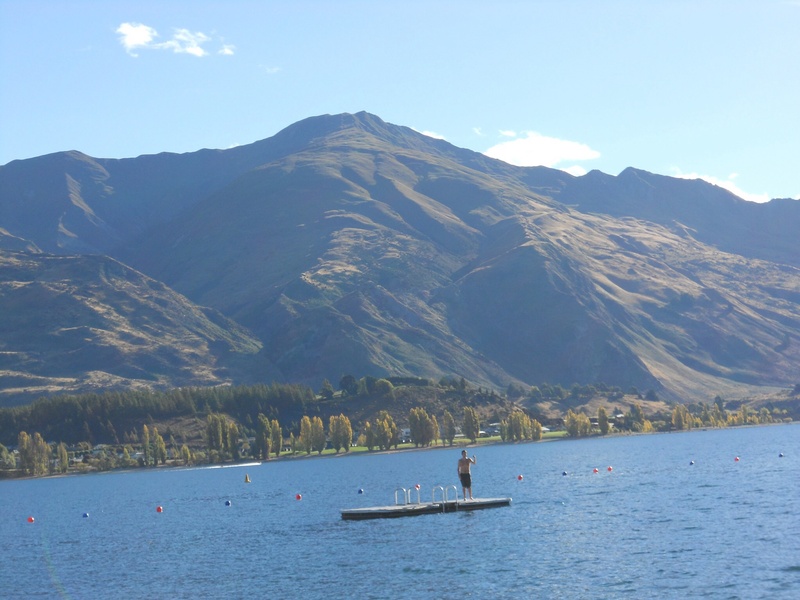 For most of April, we lived and worked in the beautiful town of Wanaka. When we drove through in our van we decided to try and find a helpx here, and managed to get a spot at Florence’s Foodstore and Cafe. 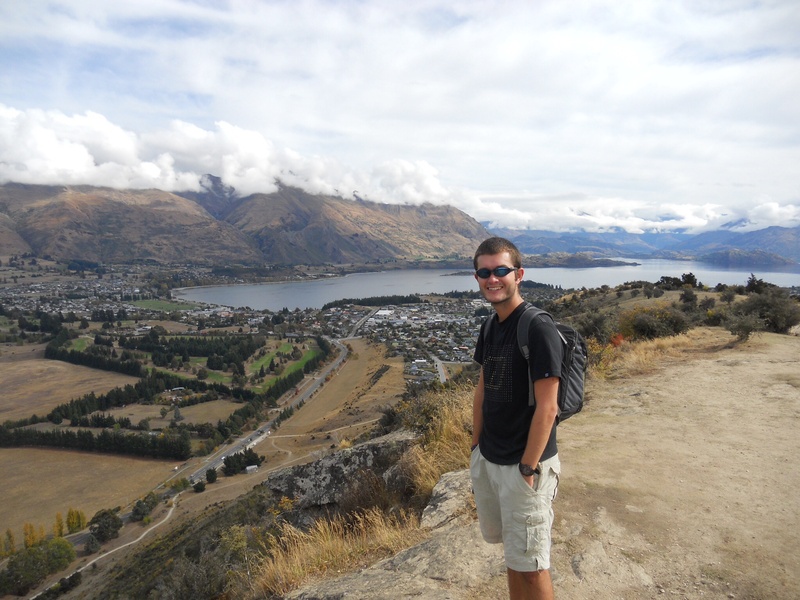 We lived with the owner, Sharyn, and David, a 17 year-old German student living in New Zealand for the year. After the nomadic (and compact) life of the camper, staying in a whole house was a nice change! A comfy double bed, our own living room and a nice home cooked meal every night were the rewards for our 28 hours a week. From Monday to Friday, we worked from 10.30-3.30 in the cafe. While Laura’s Granary training soon kicked in, and she quickly established herself as a key member of the team, running food and using the till, I made do with the more manly tasks of cleaning the toilets and washing up. It wasn’t too bad though, and during a quieter week I spent the whole time working outside on the gardens. The team at Florence’s are all great, and we were made to feel a part of the family – the chef’s lunches and daily barista coffees were also pretty sweet! Over the Easter weekend, when things were insanely busy and we kept up with the pace, Sharyn labeled us both “machines”, which was high praise indeed! 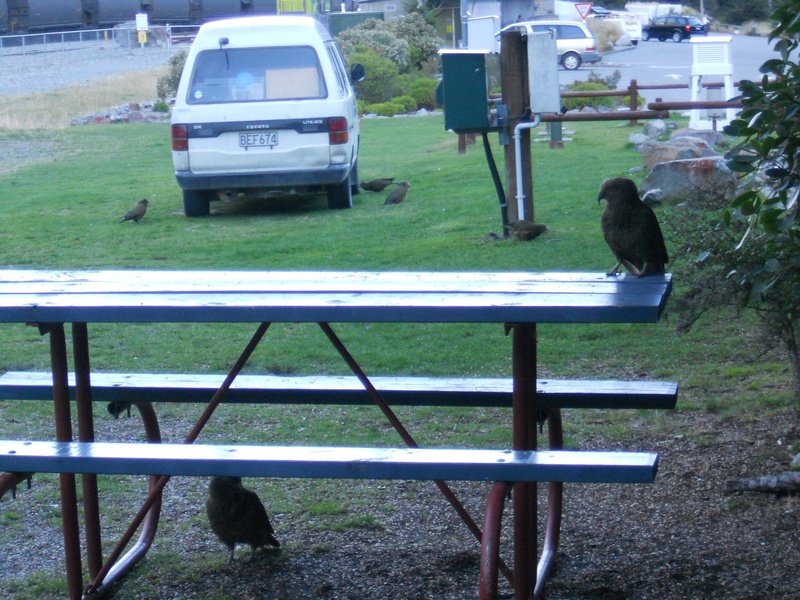 Living in the same place for the first time in months, we got into a nice routine in Wanaka. The town sits on the edge of the lake, surrounded by mountains, so our half hour walk to and from work each day was amazingly scenic. 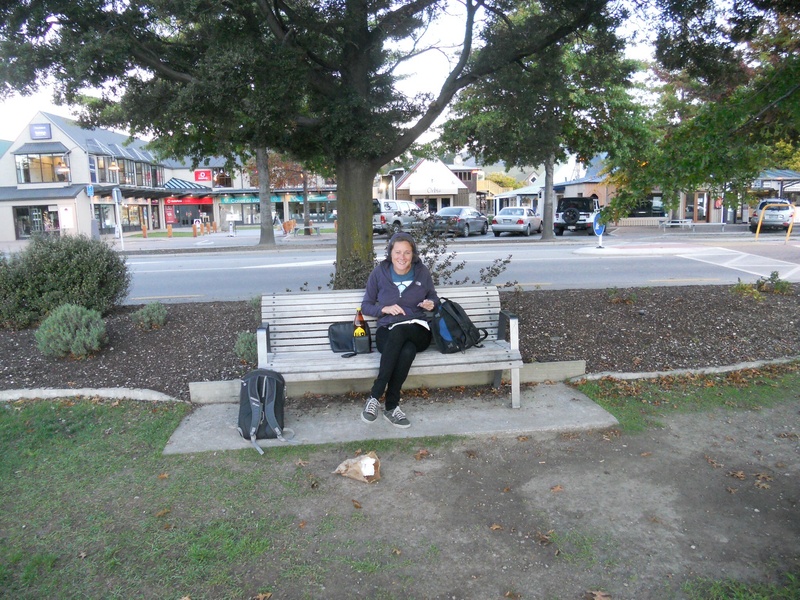 After work, we’d stroll down into town and enjoy the beach, and amazingly for New Zealand, free and unlimited wifi. Googling and facetiming at the edge of the lake was the daily ritual. For the first week we’d sunbathe and swim, and after the clocks changed we’d wrap up warm and then enjoy the 5pm happy hour with some $5 drinks. In the evenings, we made the most of Sharyn’s Video Ezy membership and rented loads of DVDs, or headed back into the town to the awesome Cinema Paradiso – Captain America for me, freshly baked interval cookies for Law. On days off we explored around the lake, and became true(ish) locals by climbing Mount Iron. Towards the end of our time and as Autumn set in, and the leaves changed to an amazing range of colours and snow began to appear on the mountain tops, we were still there in time for the Warbirds over Wanaka festival. 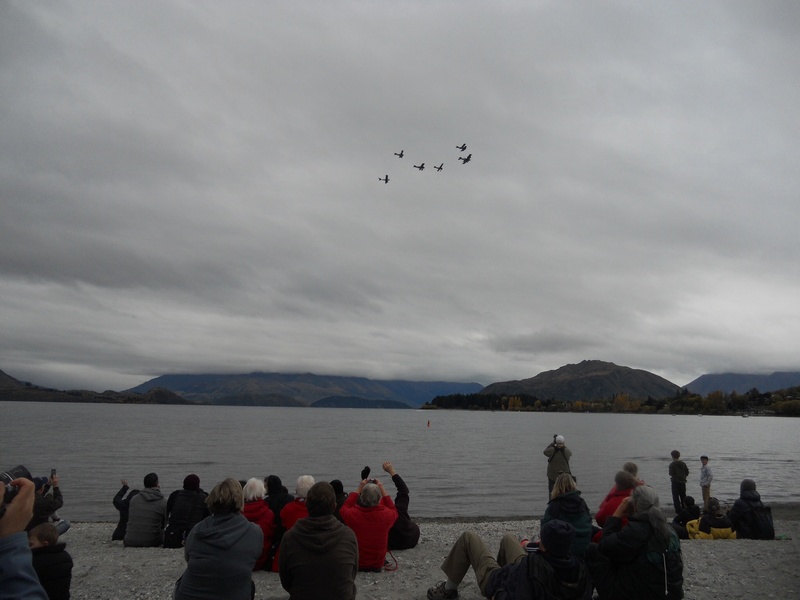 The event runs every two years, and for days we could see and hear aeroplanes from WW1 onwards flying overhead and even saw the biggest crowd we’d ever seen in New Zealand at a lakeside aerial dogfight recreation. This was the longest we’d spent in any place since volunteering, and it felt nice just to chill. 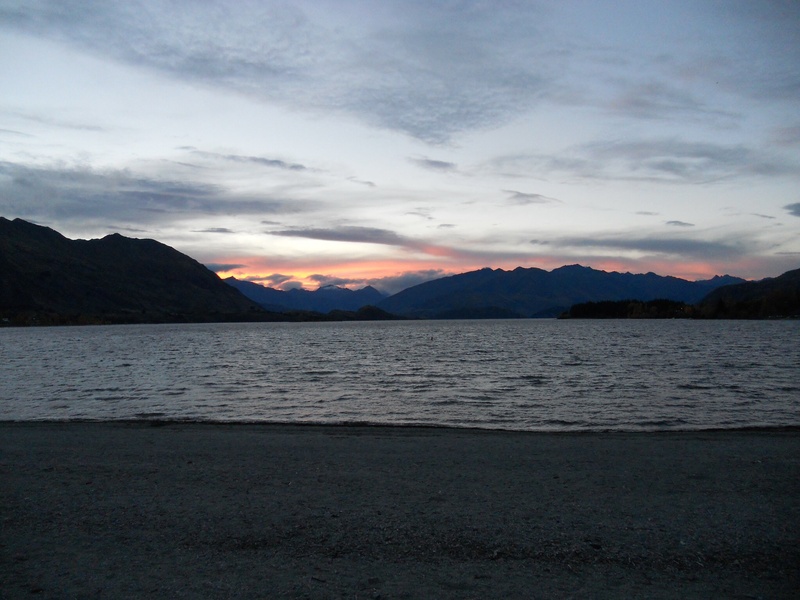 Wanaka is such a cool town, and there aren’t many places we’d rather have worked and played for 3 and half weeks. So, thanks Video Ezy, The Trout, The Kai, BoaBoa Burger, Cinema Paradiso and of course Florence’s, we’ll miss you! Whilst in Wanaka, and knowing that we’d need to stop spending money for a while after saying goodbye to our van, we lined ourselves up a helpx at a cafe in the town. This meant that after saying goodbye to Rachel and Anika we’d only have a few more days of freedom before 3 weeks of potentially hard work! 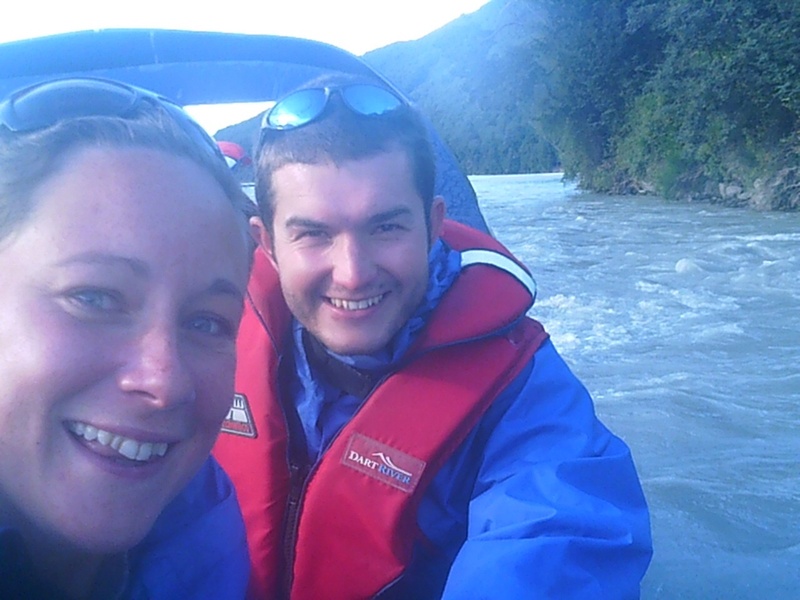 It seemed impossible to leave Queenstown without doing at least one expensive day of adventure activity, so we decided to go with a Dart River jet boat / kayak day trip. It was expensive, but also totally worth it! 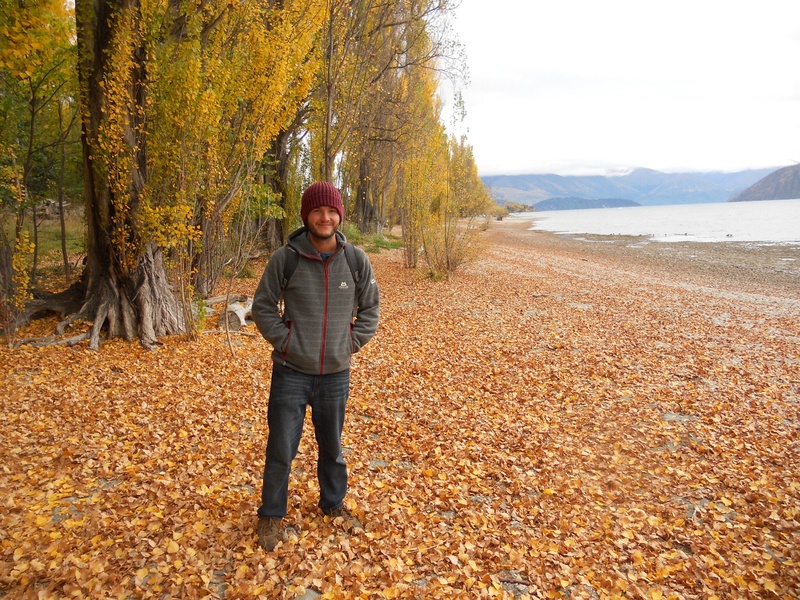 We drove out to Glenorchy, and the road hugs the lake the whole way with mountains in all directions, and when we arrived were kitted out in wetsuits, boots, fleeces, life jackets and waterproofs. It was a sunny day, but after the jet boat span it’s first 360, the outfits proved their worth. The boat zoomed up the river for about an hour, cutting close to the edges and flying over the shallows, stopping to show us some scenery or to do another 360 along the way. After an hour, and about 40km upstream, we transferred to some inflatable canoes aka funyaks, and began to gently paddle back down the river. It was nice to take the time to properly enjoy the views, so once again a load of photos that will never do it justice were taken. We stopped for a picnic lunch, and one point canoed (funyaked?) up a tiny, narrow little gorge of glacial melt, where the water was bright turquoise, before heading back to the trucks. 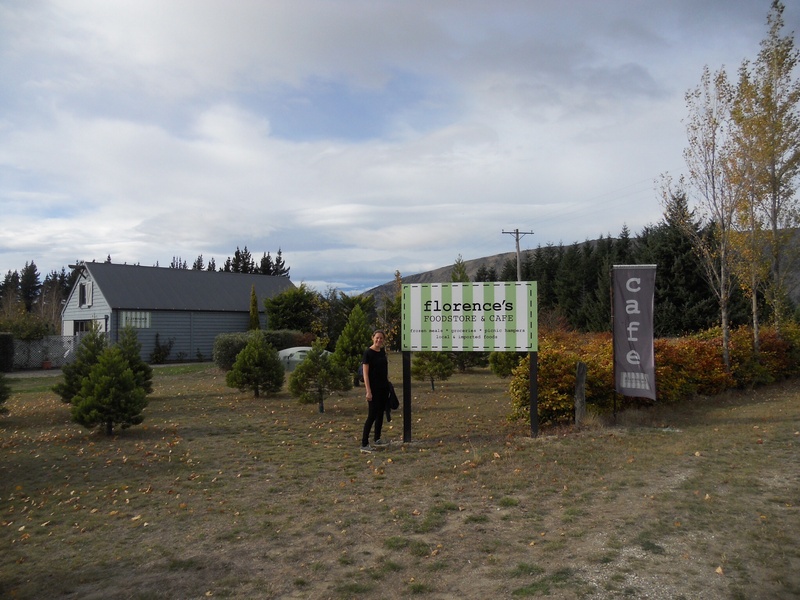 On the drive back, we went via a place called Paradise, where loads of scenes from LOTR were shot. Best. Daytrip. Ever. 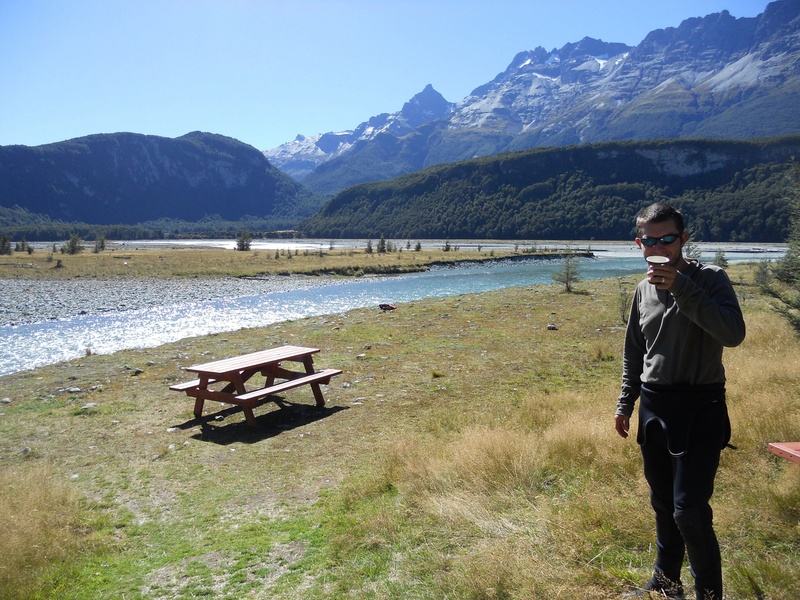 After leaving Queenstown we drove up the West Coast, over the Haast Pass, camping at some really nice sites along the way. Whilst the DOC sites are basic, for $6 each they always seem to be in amazing locations. 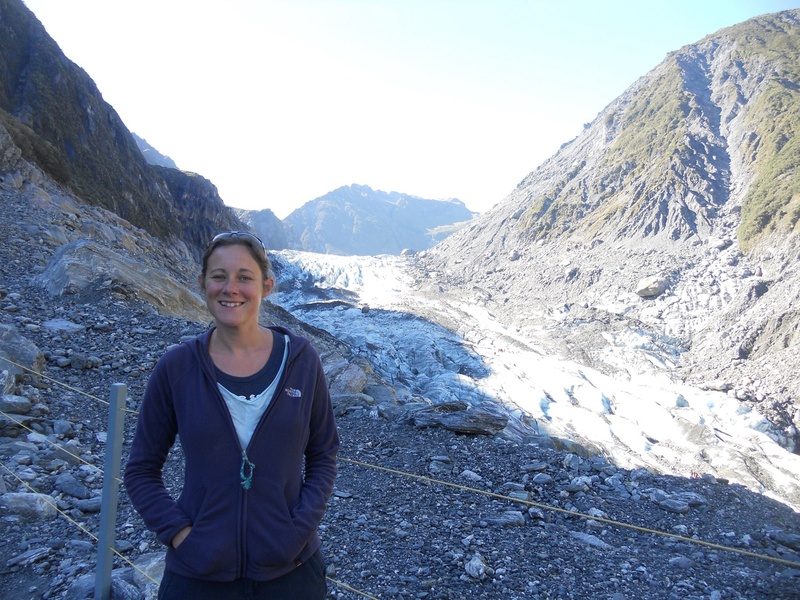 We visited both Fox and Franz Josef Glaciers and did a nice couple of day walks around them. At the rate the glaciers are retreating, it seemed like soon they’d only be accessible by helicopter. The glaciers were impressive, but the real highlight of the West Coast (aside from an awesome Whitebait fritter) was a FaceTime chat with the Roe family and the chance to say hello to their newest addition! 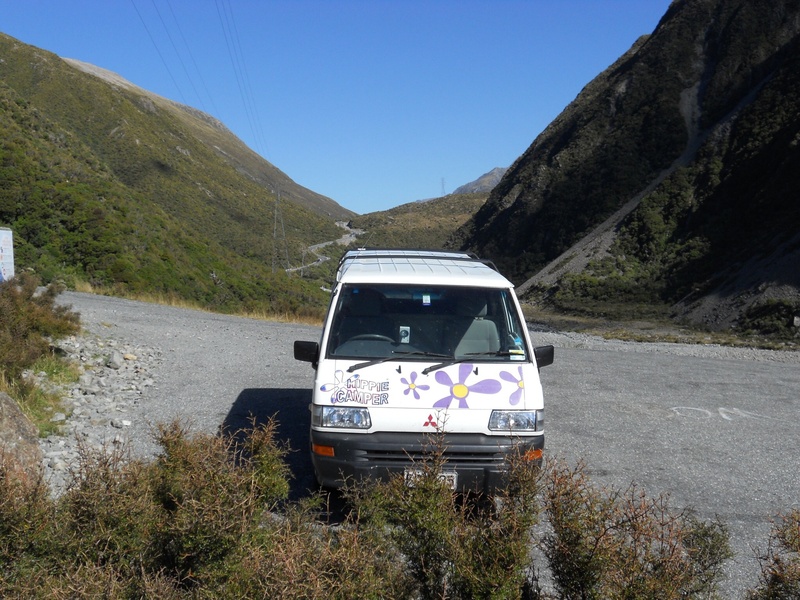 On our last full day with the van, we found a discounted horse trekking place online which was on the way back to Christchurch. Not being especially horsey people, we weren’t too sure what to expect, but it was brilliant. 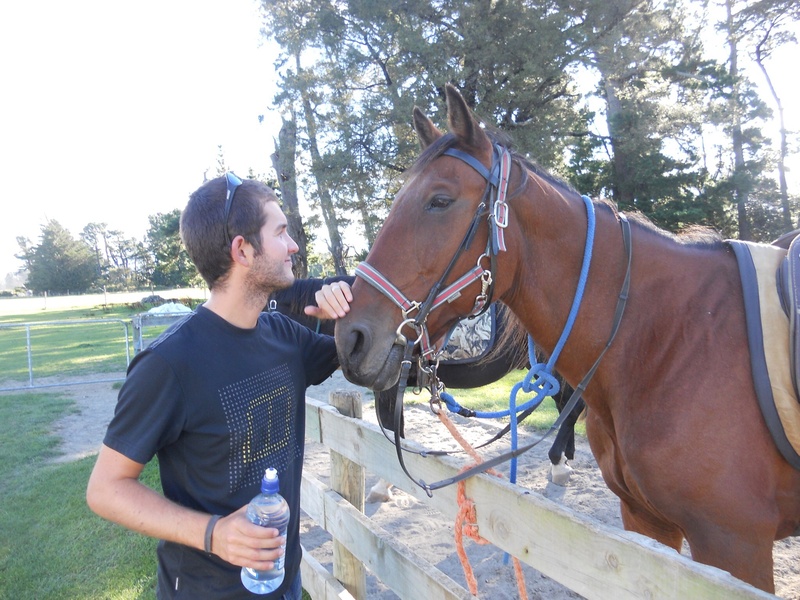 We rode for about 2 and half hours, across paddocks, along some huge steep paths over a valley, up and down some hills and along a river. 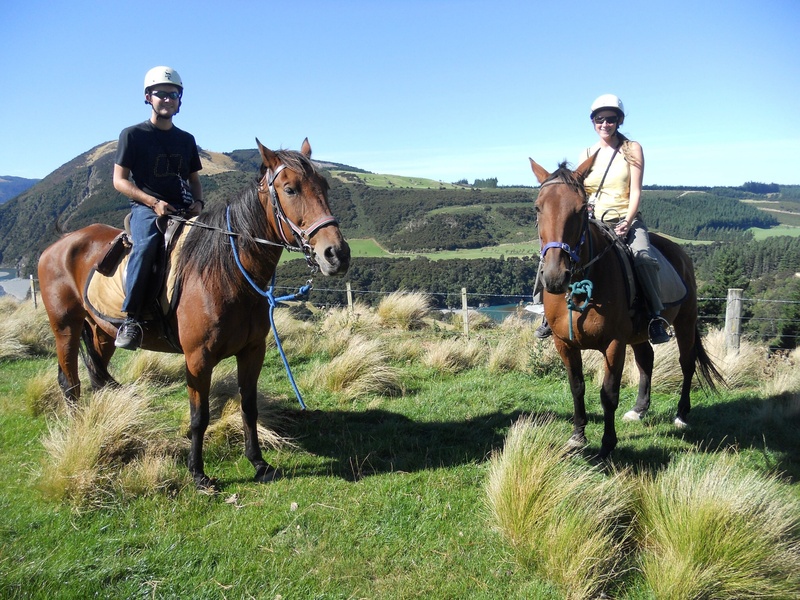 As ever, the views were amazing and our horses, Mr Bojangles and Samson, were very nice to us! When the time came, we said farewell to the van at Christchurch, and after paying for a couple of windscreen chips (damn NZ roads), we headed into the city. We had a brilliant 3 and bit weeks in the camper, and going back to getting the bus has been tough! 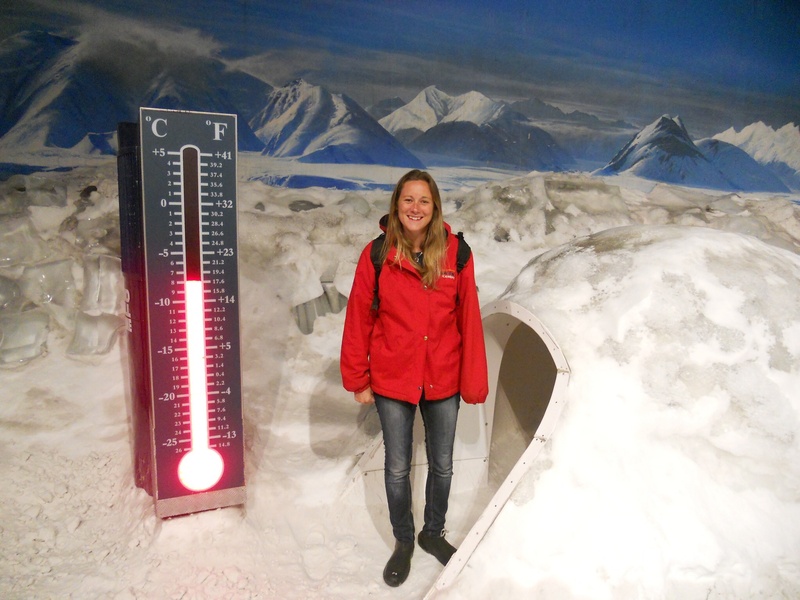 With a few days until we needed to be in Wanaka for work, we visited the Antarctica Centre in Christchurch (very ’cool’, but I was happy we got half price tickets) and then headed up the coast a bit to Kaikoura for a couple of days. 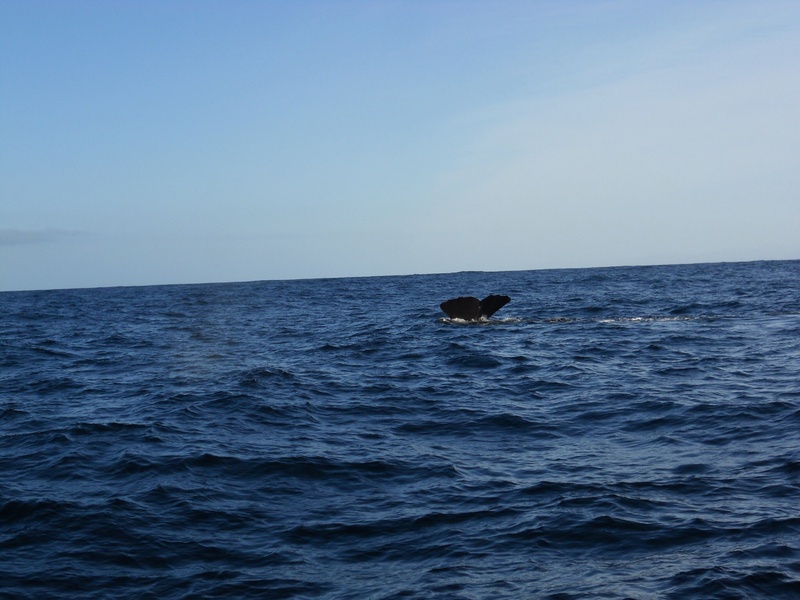 In Kaikoura, and special thanks to Mr and Mrs B for our early birthday present, we went out whale watching. 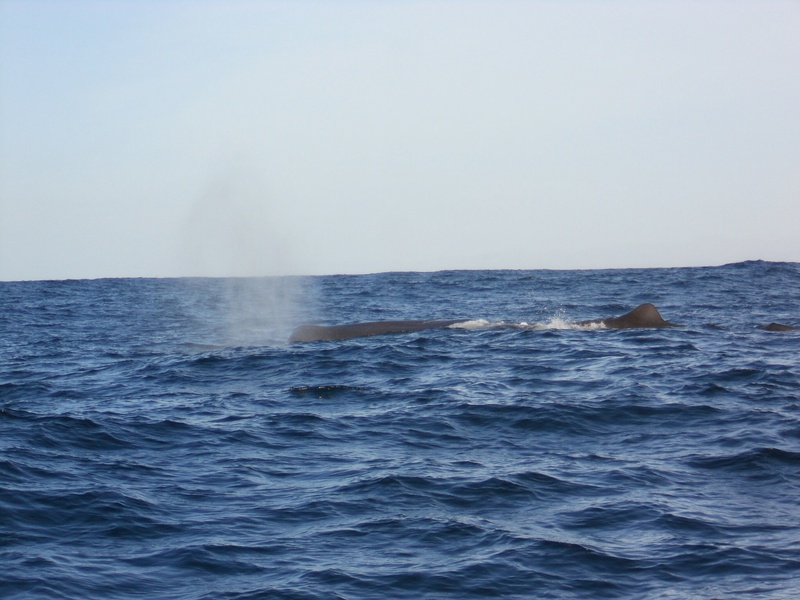 Due to the position of the continental shelf at the Kaikoura peninsula (I listened and learned), there is a deep ravine a few miles off shore perfect for whales. We got the first boat of the day nice and early, and after bouncing out over the waves we stopped and waited, with the captain listening via sonar. Suddenly, a whale burst from the surface, and we got to watch him swim around for about 15 minutes before he put his tail up and dove back down for some food. As we waited for his return appearance (they stay down for around 40 minutes before coming back up for air – more learning), we watched albatrosses fly and fish around us. Awesome. 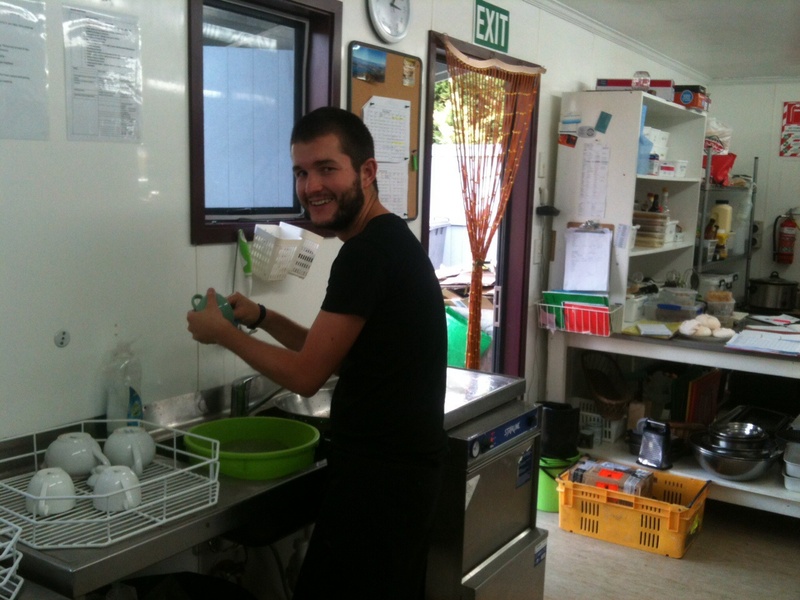 After all these weeks of fun (and spending), we’re now back doing another helpx at cafe / deli in Wanaka. For four or five hours work a day of pot washing, waiting and odd jobs, we are living in a nice house in town, eating delicious food and, with a view of snow capped mountains, went for a dip in the lake after finishing today. It’s tough being back at work.